The top spot, perhaps unsurprisingly goes to a blue diamond. Master jewellers Chopard set the flawless oval gemstone into a ring consisting of a diamond band set in white gold. Blue diamonds rarely occur in nature, and are caused by traces of boron in diamond's lattice structure. Diamonds lacking visible nitrogen impurities, which tend to discolour them with a dirty yellow tinge, are rarer still. This one is a vibrant icy blue. The most famous blue diamond in the world, the Hope Diamond, named after one of its owners of that name, now resides in the Smithsonian museum. It was once set in a necklace by Louis XV, and was supposed to be cursed, with the many supposed victims of the curse including Marie Antoinette. The curse was a complete fabrication, based on the false idea that it had been one of two eyes of a statue in a Hindu temple, but this was never the case. The Hope is actually greyer than the subject of this list which, whilst not showy, is impossible to ignore. It resembles an engagement ring which, whilst a fairly hefty investment, would be unlikely to be greeted with a 'no'. It is valued at £9.8m. British jewellers Garrard have set this patriotically named piece on a diamond necklace. The central jewel weighs a substantial 40.63 carats (eight and one eight grams) and derives from Burma. The clear, deep red gem has been cut with a small dint at the top to yield the shape referred to by the name. Burma has been the source of other great rubies, notably the DeLong Star ruby which now resides in the American Museum of Natural History. That ruby was once stolen, ransomed for $25,000 and dropped off in a phone booth. This one would likely fetch more, being valued at £8.48m. 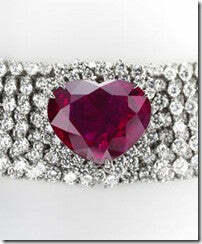 The famous jeweller Harry Winston of California loans out close to $1bn worth of jewellery to stars for Oscar night. It should therefore be no surprise to see his name associated with a piece on this list. The 2006 earrings, which are set in platinum, are accurately described as 'Diamond Drop', in reference to the sizeable droplets of white diamond hanging free from somewhat smaller diamonds above. They weigh 60.1 carats between them and are valued at £5.25m. And no, you have to buy them as a pair. The then record breaking price of £4.84m was obtained for a flawless fancy vivid blue diamond set in a simple ring in Hong Kong. The squarish cut gem which weighs 6.04 carats has an unusual dark hue and is particularly sparkling. Lorraine Schwartz provided an 18 carat emerald cut diamond-in-platinum ring to seal the knot between the stars. The ring which was intended to unite the two Paris heirs: Hilton and her then fiancé, shipping millionaire Paris Latsis is 24 carat emerald cut, and thought to be worth £2.85m. De Beers think that the famous French queen would have loved its 181 carats necklace with a mix of cut white and fancy vivid coloured diamonds down the centre. The price tag is £2.24m. The Black Eyed Peas singer topped off her wedding with a gold necklace heavily slung with diamonds, designed by H Stern - a small matter of £1.92m. The alternating of clear white and deep green gems gives a beautiful, shimmering, watery effect. The 191 carats of Columbian emeralds dominate the rose cut diamonds, and the effect is impossible to ignore, even from the far side of a room. With an attention-seizing main pear-shaped white diamond of 41.4 carats surrounded by smaller, clear circular and pear diamonds, Tiffany's proudest neckwear seems something of a bargain at £1.54m.